Happy Thanksgiving Eve! It’s been quite a busy couple days – I wasn’t able to post anything yesterday because we forgot to pay the internet bill so, yeah, no internet. I swear we’re responsible adults. I suppose I could’ve posted from my phone over some 4Gs, but truthfully, I was tired and not that upset that the internet was down. It’s been a ton of fun getting prepped for our first holiday hosting event. 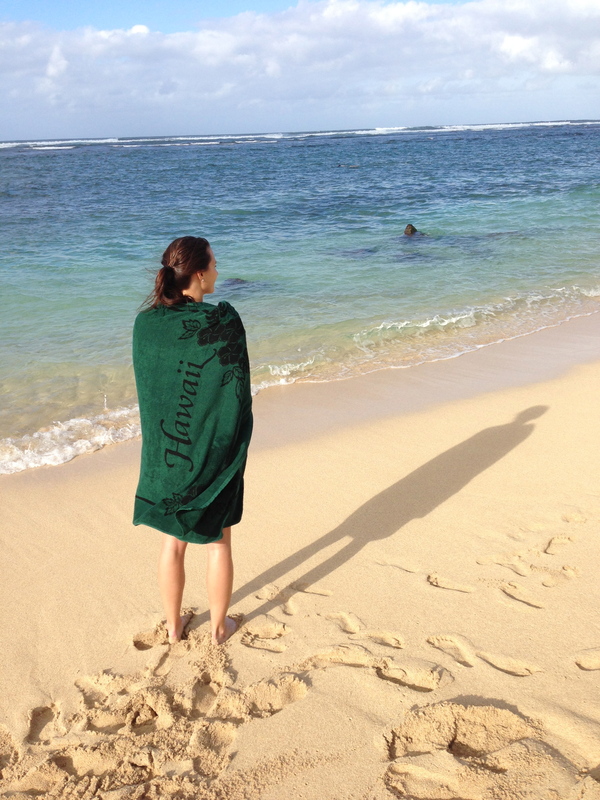 Yesterday was cleaning day – we even dusted! 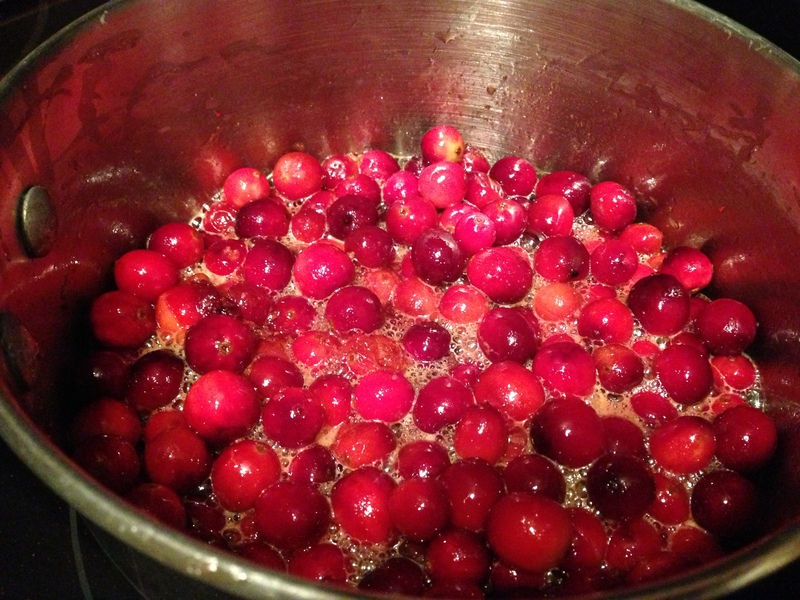 And cranberry sauce day. I couldn’t believe how simple it was to make! The only ingredient I had to buy outside my normal shopping list was a bag of fresh cranberries. This is the recipe I ‘borrowed’ from Savory Sweet Life. Optional: 2oz gold rum which I omitted because I decided it would taste better as a shot. Kidding, I just didn’t have any. Combine all ingredients in sauce pan and cook on medium to high heat for 15-20 minutes. Mine took 20 on just over medium heat. The higher heat kept bubbling up on me. 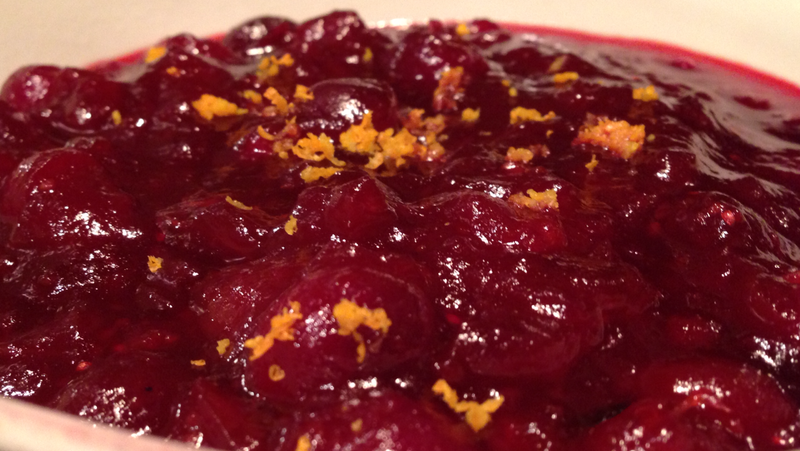 Confession – I don’t even like cranberry sauce, but this is GOOD! I personally prefer jelly-ish condiments chilled, however the recipe calls for it to be brought to room temp or slightly warmed. Pick your fancy! Today was a doozy! I woke up before Daniel around 7:15am. By the time his bed-head got up at 8:30 I already had my brine prepared. I was glad to be ahead of schedule and proudly marched to the fridge to get the turkey cleaned and in the liquid. Guess what I got for gloating? A half FROZEN turkey! Are you kidding me?? We bought the 12.59lb turkey on Sunday and it’s been thawing since then. I looked up like 15 websites (before purchase) that said it should take 24-48 hours for a 12lb turkey to thaw. Guess the .59 extra pounds really did us in. Anyway, I recovered somewhat quickly by make-shifting a spa bath for our bird in a small cooler full of cold water. It was sort of a pain to baby-sit the water temperature but it paid off because in a matter of 3 hours the turkey was ready (enough) to brine. 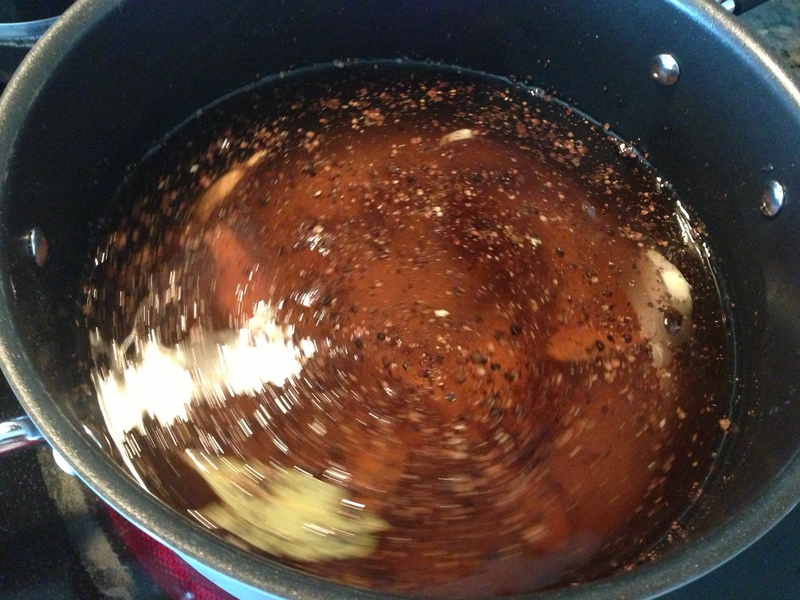 Brine includes: sugar, salt, cider, ginger, whole allspice, whole peppercorns, and whole cloves, plus oranges for the cavity and ice to keep it really cold. 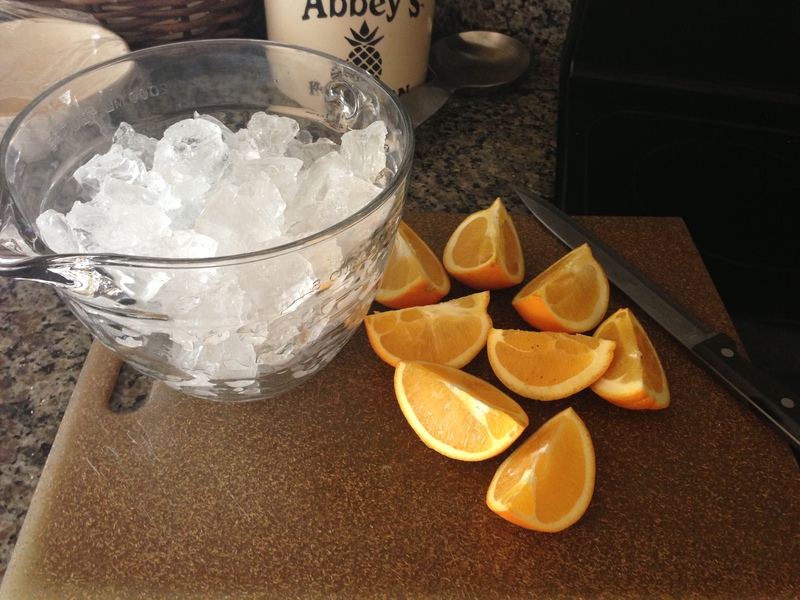 ice and oranges – still life. For the record – handling turkey is disgusting, and COLD. I thought Daniel was going to have to drive me to the hospital to get my frostbitten fingers amputated. After spilling the contaminated contents of the cooler all over the floor (so sick), we finally got the bird situated in the fridge. It has to be turned every few hours to let the juices absorb evenly; let me tell you, I sure have enjoyed flipping the bird all today. You may recall from Monday’s post that was supposed to make the stuffing today. It didn’t happen. I actually got everything set to go, even toasted the bread cubes, and then decided to postpone until tomorrow. The recipe isn’t difficult, and I was concerned that everything would get soggy if I made it too soon. Probably just paranoia, but it has been bumped to the Turkey Day To-Do List. 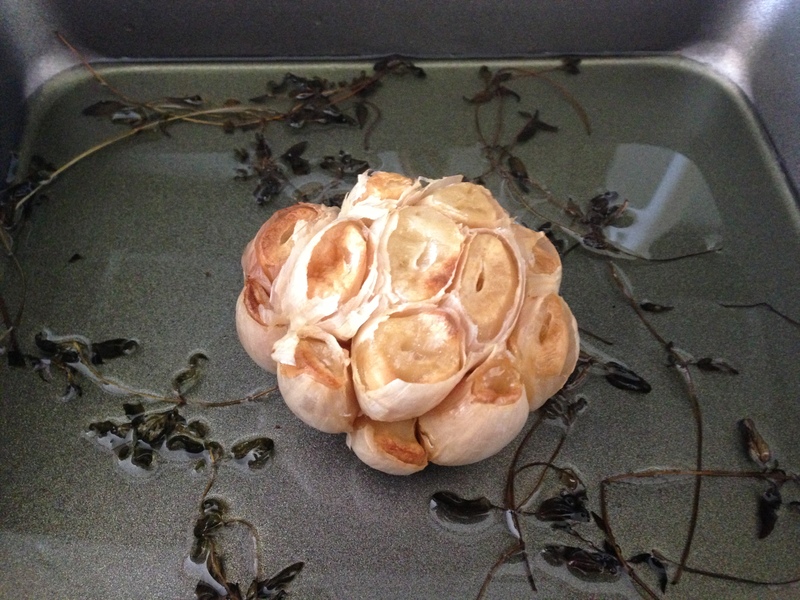 I did, however, roast an entire head of garlic (that’s a first!) in some thyme and olive oil for the mashed potatoes. The day continued with an episode of slicing and de-seeding the “seedless” grapes (so annoying), chopping apples, and dissecting oranges for a traditional fruit salad. I’ll add bananas and walnuts tomorrow just before dinner. 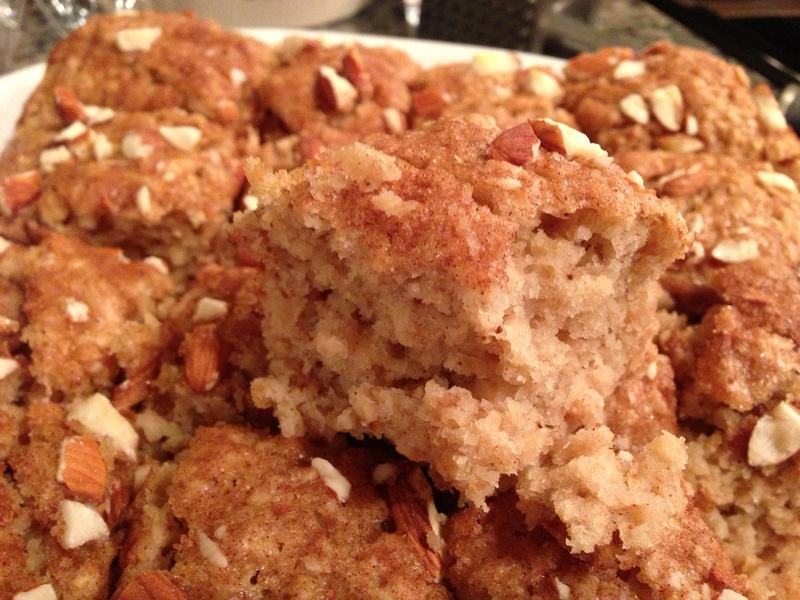 I was worried about my lack of breakfast options, so I steam-rolled ahead into making a low-sugar coffee cake with applesauce and quick oats; I found the recipe on the American Diabetes Association site, although I halved it and added chopped almonds. It has great texture – very moist. I think it’ll be good warmed with honey tomorrow. Whenever you can spare some sugar and major calories without losing out on flavor, I say do it! Applesauce (especially low or no sugar-added) is a great 1-1 substitute for butter and fats because it adds moisture. You can even use this in cookies and chocolate cake! Just make sure to reduce or at least monitor your baking time because removing some fat will usually speed the cooking process. Preheat oven to 375. Mix all dry ingredients in bowl. Mix all wet ingredients in separate bowl. Combine mixtures. Pour into greased 8×8 pan and bake for 25 minutes. 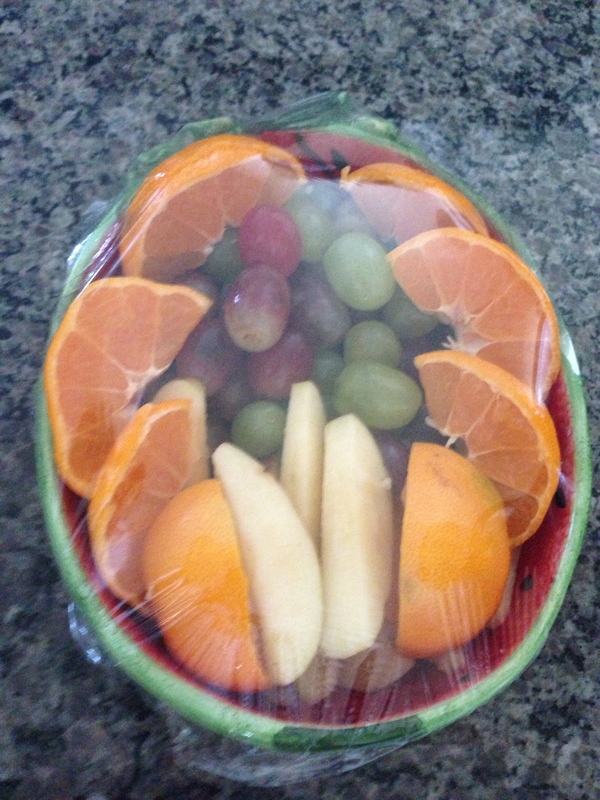 I also prepared a second “breakfast fruit salad” of more grapes, apple slices and oranges. I got lazy and opted to let everyone de-seed their own morning grape helpings. breakfast fruit – please excuse the whole grapes. Finally, it was time make one last wine and cheese run (Lagranja 360 and light Brie from Trader Joes) before picking up Daniel’s parents from the airport! We’re so THANKFUL they made the trip from south Florida to spend the holiday … and help us close out our stent in Arizona before we move to Hawaii. It’s technically official, so Happy Thanksgiving everyone!! I have to start the green beans in T-minus 6 hours so I’m going to call it a night. Everything sounds so good! We really wish we were there to celebrate with you guys and eat this super yummy meal! Xoxo and Happy Thanksgiving! 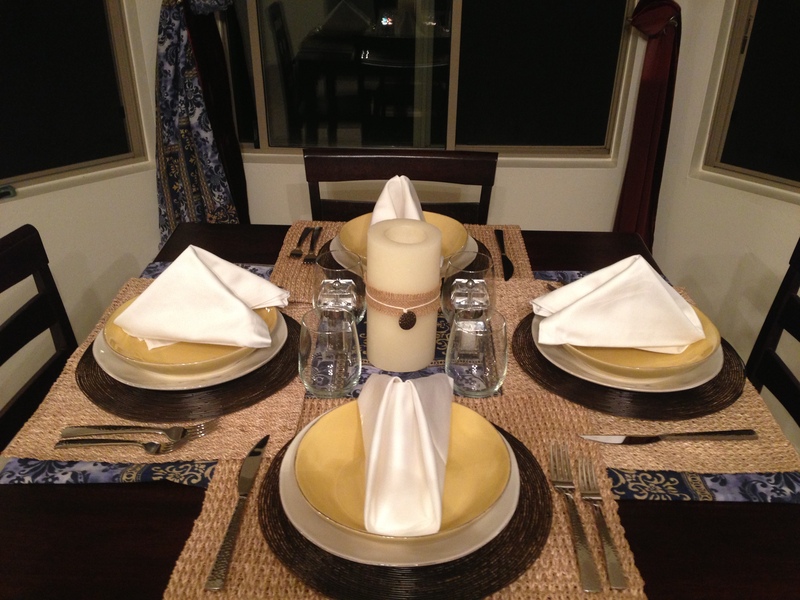 More re-blog from last year’s prep for turkey day – re blogging offers me easy access when I’m shopping!